Gandhi's state religion, Buddhism, had spread to my empire earlier. Because Caesar was a Buddhist too, I had decided to convert to it as well, to strengthen the friendship between our three nations. Victoria on the other hand had founded and converted to Christianity. 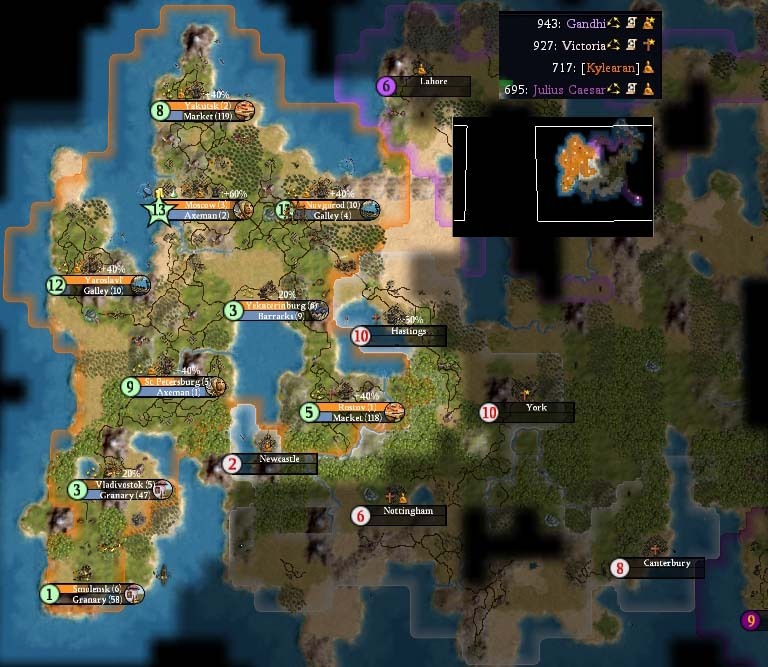 Since she also was leading in tech, and had cities on my border that would fit well into my empire, she was a natural target to attack before her units became too advanced. Hastings was defended by two longbows, one of them city garrison I, and a crossbowman. 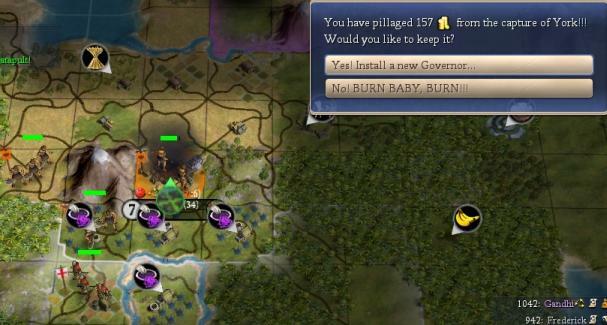 After bombarding the city, I sent in some suicide catapults to protect my more experienced axemen, and took the city. So far it had been easy, but this is always the case during the first turns of a surprise attack, as the AIs need some turns to assemble their stacks! And indeed, some turns later I had to learn that she also had knights at her disposal. So it was my spears against her knights, and my axemen against her longbows and crossbows...not what I would call a fair or easy fight! 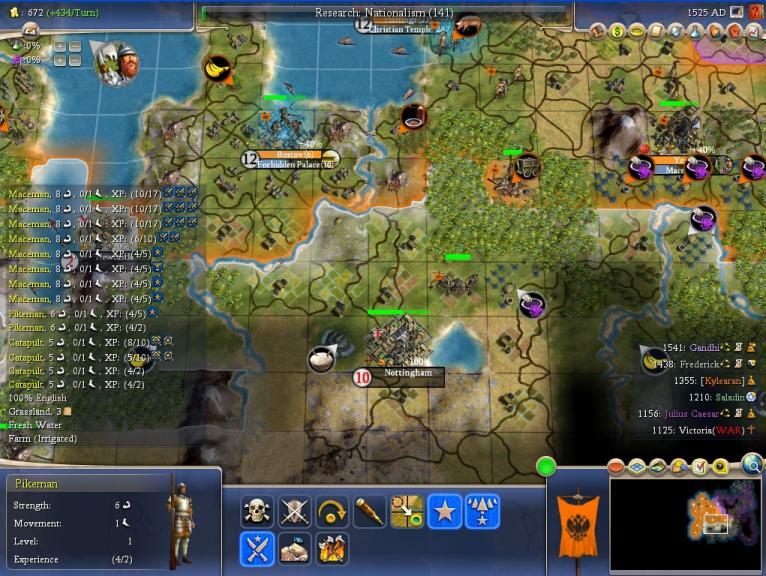 Especially her crossbowmen gave me a lot of trouble, as they easily killed my axemen. But my whole empire was on military production now, and I ignored the casualties I had and slowly advanced on York, a city with iron in reach! My stack lost several units to her counterattacks while I bombarded the city, but I managed to capture it nonetheless in 1150AD, albeit barely. Two turns later, I had to realize that I no longer had an army to advance with, and already had problems defending Hastings and York, so I decided to make peace again. I had hoped to get a tech from Victoria, but she was only willing to part with 150 gold - nothing to complain about really, considering that she would have been able to take both cities back again during the next turns. During the war in 1100AD, Frederick had found me. While he already had the techs to build caravels, he lacked Alphabet! 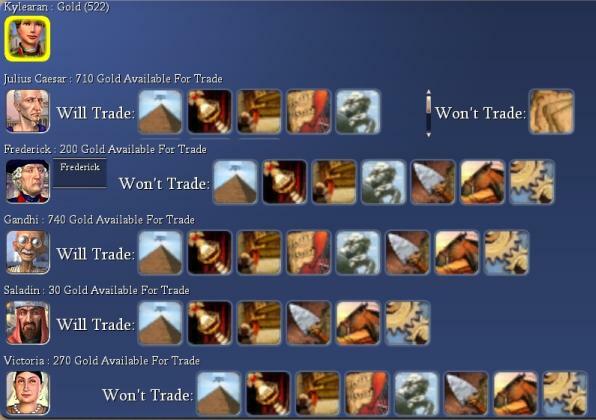 So I immediately bought the tech from Caesar for 720 gold, intending to trade it away to Frederick on the next turn. Next turn however, he suddenly knew Alphabet! Argh, I had just wasted a lot of money on a tech I had no use for at the moment. Frederick had Civil Service though, a tech Rome had not. So maybe a deal was possible there? I saved the game, ending my session for that day. The next day, I loaded the game...and suddenly, Frederick refused to sell me the tech "because we fear you are becoming too advanced"! I had no idea what had happened there... apparently, he had needed a good night's sleep to decide that. Of course, next turn everybody had it, so there went another opportunity. 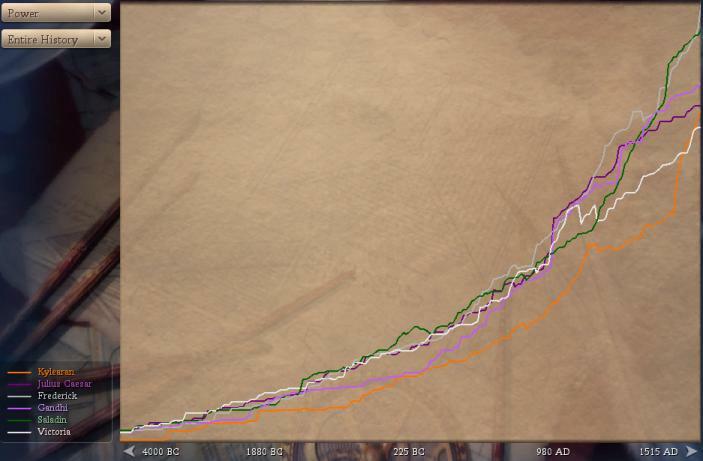 Saladin found me next with a caravel, and he and the others were still willing to trade with me. I had very bad luck though: Three times, I bought a tech one other AI was missing, but was unable to trade it away next turn as all of a sudden, the AI knew the tech as well! Strange, very strange. Even more odd though was this incident: Rome lacked Optics, so I bought Optics from Gandhi. But next turn, Rome knew both Optics and Astronomy, which has Optics as a prerequisit! What the heck happened there? How was he able to get two techs on the same turn? I thought this was not possible! Note that now, in the 13th century, I was finally able to build temples, forges, and courthouses in my cities. Here's a shot that shows how behind I still was. Note how I still lacked Monotheism for organized religion, and Monarchy for hereditary rule...this almost had a Civ 3 Deity feeling to it. After whipping some courthouses and buying some more critical techs, like Civil Service for 1790g, Machinery for 1720g, Engineering for 2240g and more (note just how much money the AIs were receiving from me! ), it was time to continue my war against Victoria before she had redcoats. I had produced nothing but military for some time now, and actually had overtaken Victoria in power! 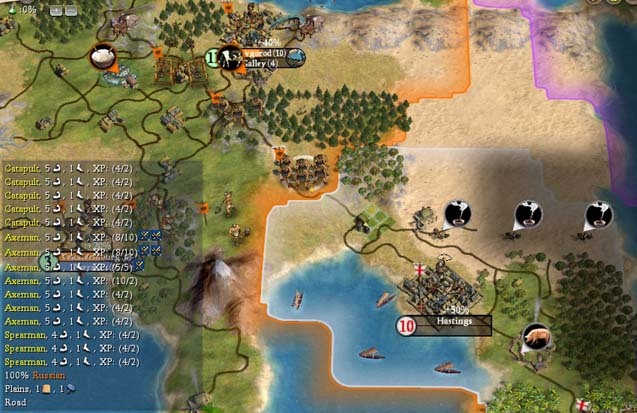 In 1525AD, when in normal games I often have riflemen already, a stack of macemen, pikemen and catapults had assembled on Viccy's border again. Note that Rostov is building the forbidden palace already, as I'm optimistic the English cities around it will soon be mine! I had protected my precious iron near York as best as I could, and now declared war on her again. She had not gotten to muskets yet, so I quickly captured Nottingham, again protecting my macemen by sending in suicide catapults against her longbows first. After Nottingham, I advanced on London. 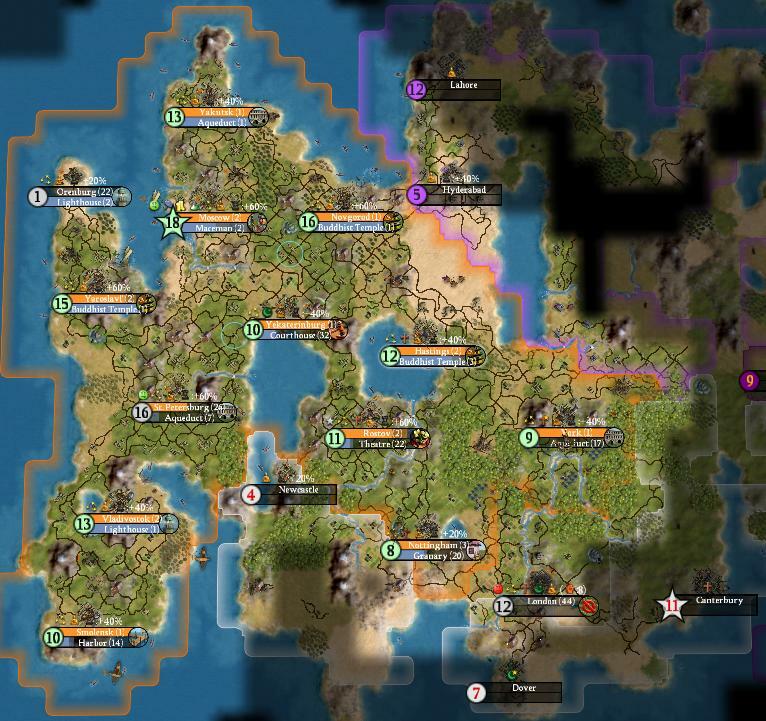 Normally, AIs protect their capitals heavily, so I was quite surprised to find only three longbows (one city garrison II, one city garrison I, and one unpromoted) plus a medic pikemen there. Strange! 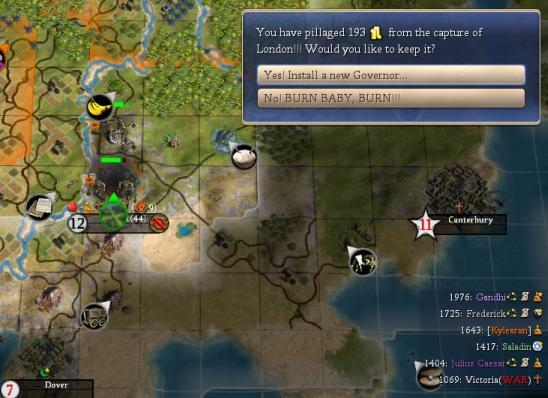 So again, I only lost a few catapults and took the English capital. Now my army had to heal and catapults had to be rebuilt, so I made peace with Victoria again - her empire was divided, and I would resume the war soon enough.